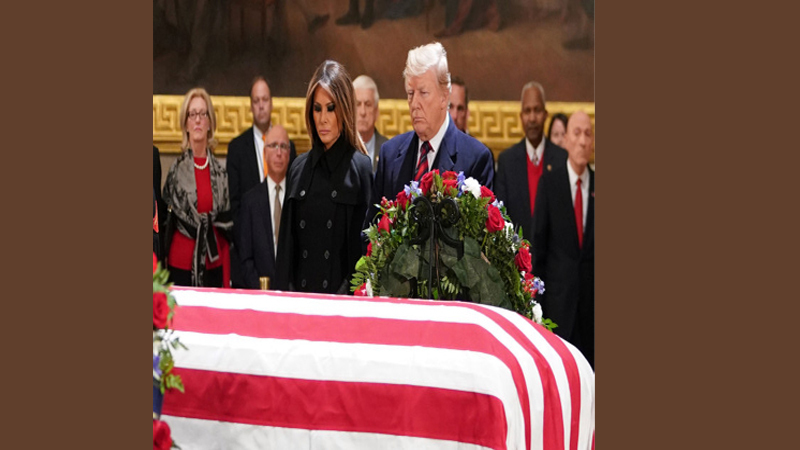 US President Donald Trump and his wife Melania have paid their respects to President George HW Bush as he lies in state at the US Capitol. Trump made a brief visit to the rotunda, where the public can visit the coffin until the funeral on Wednesday. Bush, who died on Friday aged 94, will later be buried at his Texas home alongside his wife, Barbara. His coffin had earlier left Texas to a 21-gun salute and was carried to Washington on board Air Force One - temporarily renamed Special Air Mission 41 in homage to the late president. Bush, who served as the 41st US president between 1989 and 1993, had been receiving treatment for a form of Parkinson's disease and had been admitted to hospital with a blood infection in April.